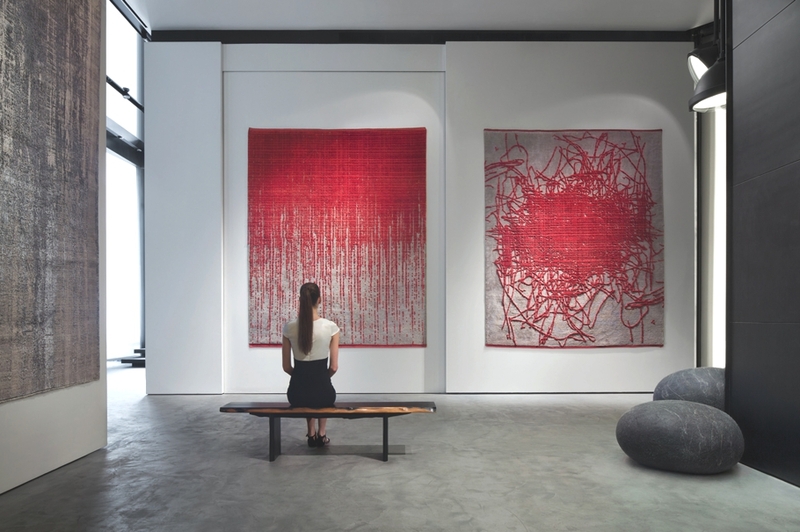 As one of the leading retailers of modern and classic carpets, designing a showroom for Iwan Maktabi has many challenges. Maria Group were commissioned to create a modern space that would be powerful yet reveal the beauty of the luxurious products on display. Allowing proper visibility of the products to be appreciated, was the main concern for the designers. The high ceiling, natural light, and beautiful open space aided the designers in coming up with ideas that would address each area perfectly. 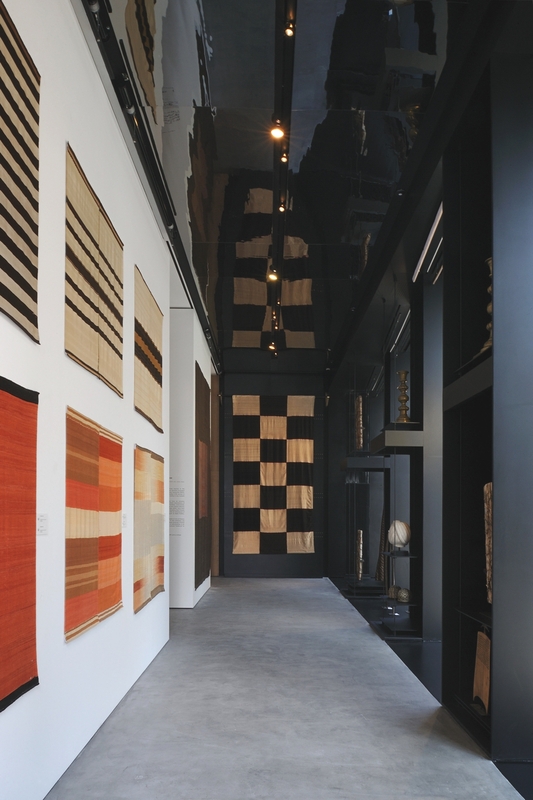 In the design of the flagship store, the challenge was to address a new type of window shop experience and to revisit ways of displaying and storing carpets. 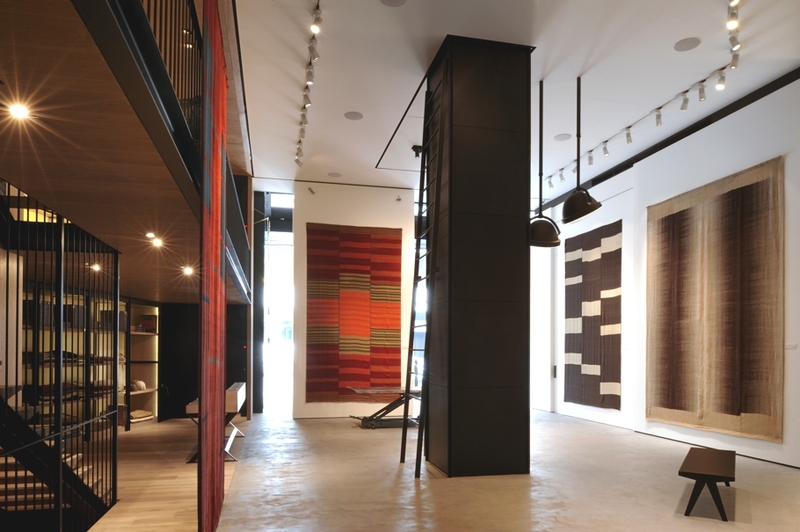 On the ground floor, the shop has 4 tall windows that face a main vehicular and pedestrian artery, and a corner window.Instead of displaying the carpets against the glass windows, the project takes the space of the window shop into the depth of the shop. About 2m recessed from the windows, the carpets are fixed to immaculate white walls: They are visible both from outside and inside. 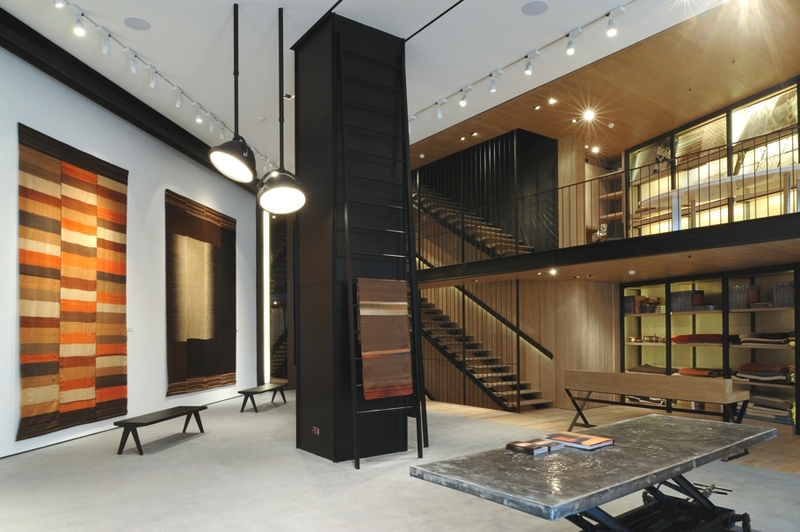 When going through the side door, the visitor is invited to cross the space of the window shop, before entering the sale area. 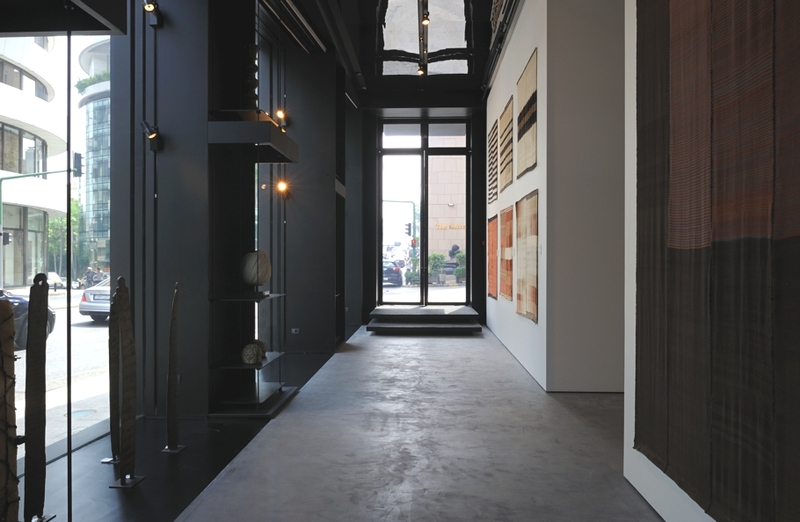 This hallway doubles as a gallery on the inside: large cabinet displays occupy the space between the windows and accentuate the rhythm of approach from the door. The solemnity of this gallery space is further enhanced by the proportions of the white walls, the tall windows, and the reflective ceiling that duplicates the space.Once inside, the shop reveals itself as an open space divided in 2: a display area with white walls, and a working area with the reception desk and the mezzanine meeting room all finished in smoked Oak wood. 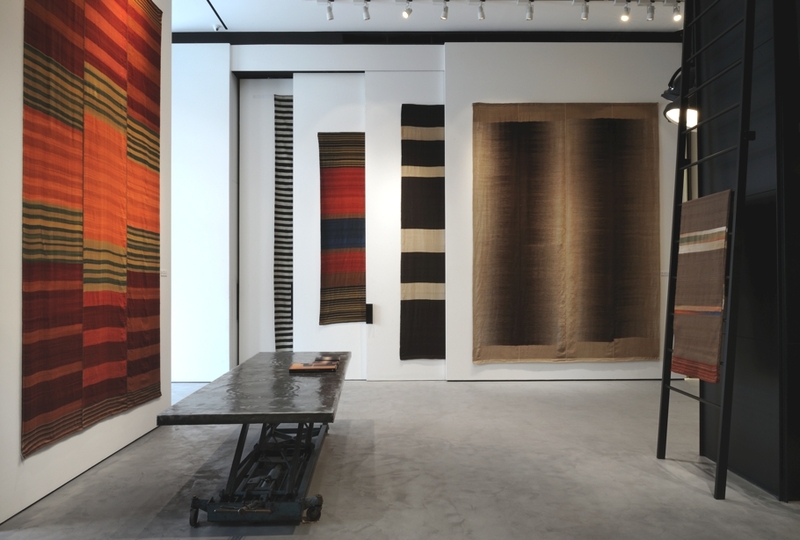 The display area is outlined with different types of display walls: large sliding walls (about 5m high) that allow for 12 rows of carpets, one behind the other; another oblique wall has a pull-down chassis mechanism that carries 3 rows of sliding tracks, and operates electrically for easy hanging and display; a third wall, which separates the entrance from the display area, slides to provide a different connection with the entrance gallery, depending on the itinerary that the curator wishes to set up. A remote controlled camera is fixed to the ceiling at 5m from the floor to take photos of carpets: an image archiving system.A central structural column supports ladder like rods that serve as additional hanging for small carpets or textiles or even samples.In the work area, defined in wood, parallel flights of stairs connect the 4 different levels of the shop. 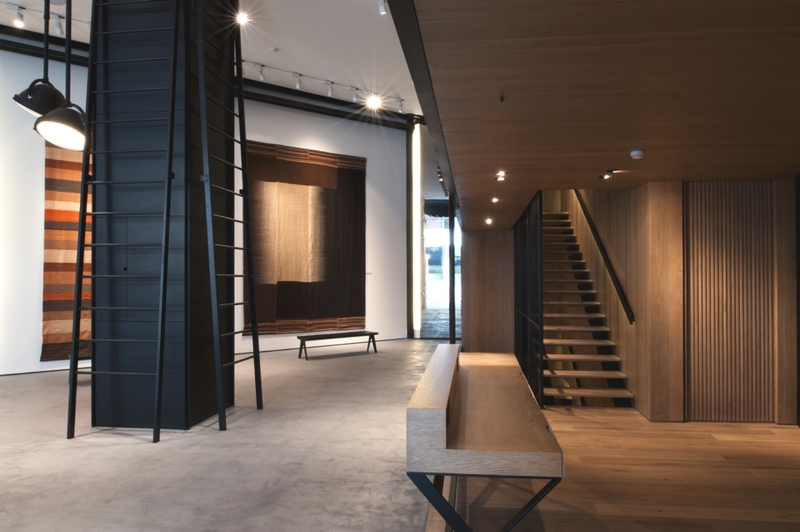 Floating steps of solid Oak are framed by wall paneling on 1 side and a grid of metal rods on the other. The stairs invite guests to discover the other levels from the ground floor. On the mezzanine, a meeting table in white carrara marble contrasts with the rough finish of the oak paneling behind. A storage library, starts ar the ground floor and continues to the mezzanine, which accentuates the connection between the 2 levels. 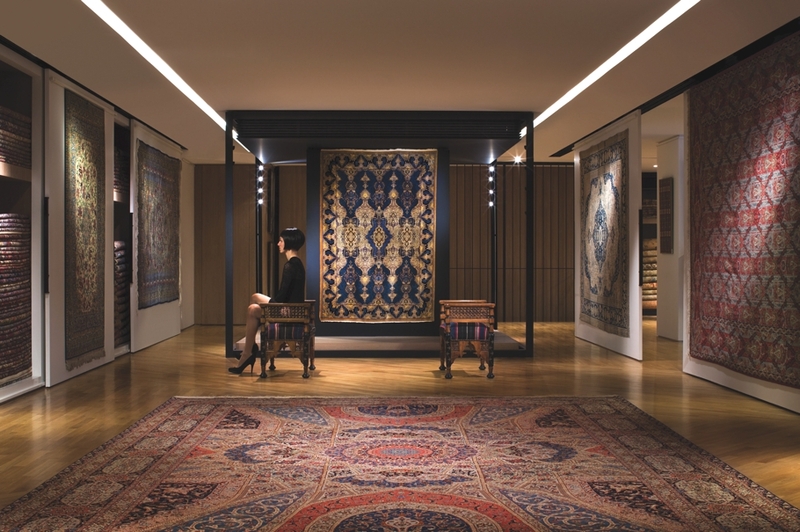 On the basment floor, the contemporary collection of carpets is displayed. With a low ceiling, all ventilation and air conditioning ducts were kept exposed. Existing walls and coffered concrete ceiling were painted black, while white walls hand from the walls and carry carpets in contrast. 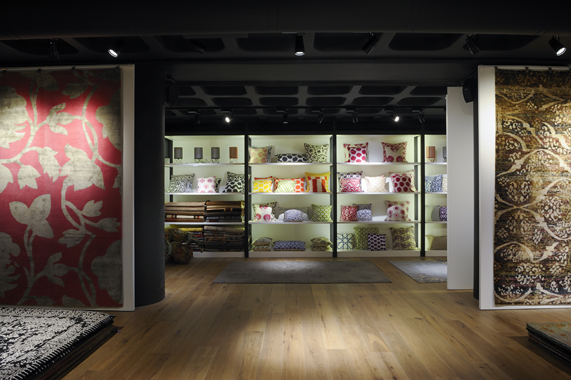 A long display shelving unit runs along the long wall and stores small carpets and decorative cushions.